1) Review In Basket Orders folder on left-hand side of screen for messages of laboratory orders that have already been signed by the attending. 2) Collect lab labels for tubes from the SCC label printer. NOTE: any IMA Firm D labs orders (EHHOP Mental Health Clinic) made on the same day will have labels printed over at the IMA Firm D nurse's station on the MHC side of clinic. 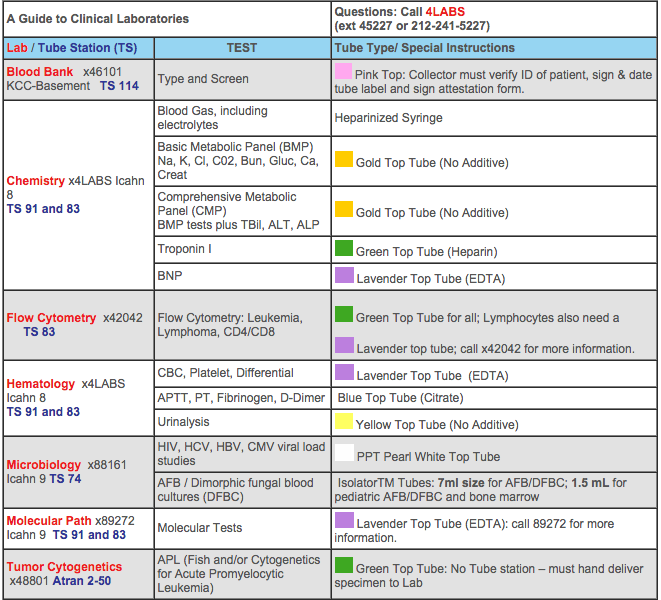 3) Draws labs in correct tube noted on labels or use the tube color guide here: Tube colors; if in doubt about which tube to use, call 4-LABS. 4) Label tubes with appropriate labels. Place labels as high up on the tube as possible so as to not obscure the bottom fluid level. Click OK, and then click Accept/Done to remove the order from the In Basket Folder. Urine Specimens (including GC/Chlamydia) are dropped off at the SAME PLACE as these blood specimens. All POCT need orders!! Clinician teams MUST verbally inform the TS of ALL POCT ORDERS. 2) Make sure the lab has been ordered as a Point of Care Test (has to say POCT next to the ordered lab); if it doesn’t, tell the clinician team or the attending to re-order the lab as a POCT and cancel the original lab order. 6) Double click on the order to open it. 7) Enter the value/result and today’s date and time. Click on the Status button located at the bottom right of the screen and change the status from In process to Final Result. The result will be sent back to the student through the In Basket. Go back to the In Basket message, highlight the order that was just completed, and click on Done located right above the messages. This should take you do the Ad Hoc search results. The Done results are all greyed out but you can still edit the result. Click on the patient and the test you want, and click Edit Result. Sterile cups/dipsticks are found in the cabinet above the sink. Use a single-wrapped, sterile, vacuum transfer to move the urine from the cup to the yellow-topped tube. MAKE SURE TO LABEL THE URINE SPECIMEN CONTAINER BEFORE GIVING TO PATIENT!!! 1) It is best to do the Udip under sterile conditions until it is determined that a UA is not needed. You can transfer the sample to a yellow-topped tube to perform the dip, as listed above. SAVE THE URINE SAMPLE UNTIL THE TEST AND RESULT ANALYSIS IS COMPLETE! 2) UDips should be developed and interpreted MANUALLY. You can find a bottle of UDip test strips in the other Nurse's/phlebotomy room on the opposite end of clinic (where the Mental Health clinic rooms usually are). The bottle should be in one of the cupboards. Follow the instructions on the bottle to interpret the Udip results. 3) Please share any abnormal results IMMEDIATELY with the team and Attending. Make sure to document the results in Epic, too. POCT GLUCOSE: We CAN do point of care glucose testing!!! Please use the GLUCOMETER and TEST STRIPS located in the EHHOP red bin by the desks where the CMs sit. The blue test strips used by the IMA machines (with the fancy touchscreen, etc.) do not work in our glucometer. If the POCT glucometer is missing, Labs TS should bring patient to IMA Firm B (other side of 7th floor) and have the nurse there perform the fingerstick. Labs TS should bring the nurse the order number from Epic. Labs TS is responsible for documentation of the results in Epic. 1) Must have THREE (3) cards. 2) Stool must come from THREE (3) different days. 3) Write your name and date on the cards BEFORE collection. Just before finishing a bowel movement, use a piece of toilet paper to collect a small sample of stool. 6) Close card, place in envelope or plastic bag. Take cards and follow instructions on the card - make sure to open the flap on the BACK of the card where the controls (+,-) can be found. Develop stool sample AND controls (+,-). RAPID STREP KITS: Located in the Nurses Station of Area D and the back supply closet. URINE PREGNANCY TESTS: Located in accessory gray drawers in Labs room. Follow the enclosed instructions. !